The Assumption of Mary is the day we celebrate the Mother of God being brought body and soul into Heaven to be reunited with her Son. Mary is the only living being besides Jesus who is believed to be brought into Heaven, body and soul, just as her Son was at the Ascension. She was the Queen Mother, Ark of the New Covenant, full of grace and not corrupted by sin. According to the book, “The Life of the Blessed Virgin Mary,” by St. Catherine Anne Emmerich, Mary yearned to be reunited with her Son again. While St. John took her in, and many of the apostles would visit, she walked the Way of the Cross with 12 stations to remember and contemplate His sufferings. In the visions St. Catherine had of Mary’s death, she stated that the apostles were all there at her deathbed and celebrated Mass. Peter gave her Holy Communion, she raised herself up to receive It and then laid back down. Then the roof of her home disappeared and St. Catherine could see her soul being separated from her body and being brought into heaven by angels. She believes Peter and John were also able to see her being raised to heaven because they too were looking up. At this point, Mary’s body was radiant, eyes closed, arms crossed on her breast, and all around her were praying. The women covered Mary’s body and prepared her body for burial. For her funeral, they took her body along the Way of the Cross, ending where she was to be buried. After most had left, there was a light from her tomb where St. Catherine watched her body being joined with her soul, along with Our Lord. After Thomas and Jonathan (another apostle and relation of the Holy Family) saw this, they begged to be shown her tomb. St. John went and opened her coffin to find it empty. 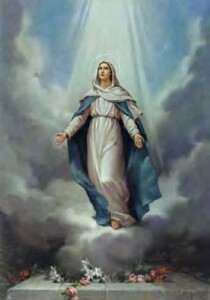 We celebrate Mary’s Assumption into Heaven on August 15th of each year. Celebrate Mass and the fulfillment of the promise of being raised body and soul into heaven. We too will be included in this promise if we love our Queen Mother and are faithful to Our Lord, her Son, Jesus Christ.